Our client’s luxurious rural home is set on the brow of a hill and enjoys stunning views over the surrounding countryside. We were tasked with the spatial planning and interior design of a new-build wing to the property providing comfortable and relaxing entertainment spaces over a split-level ground floor. The main living space is divided by a contemporary log-burning fireplace, the new wing also features a bar and library and is complemented by a basement extension with wine cellar and luxurious home cinema. A sense of light and space permeates the upper floor; bespoke bookcases emphasise the height of the room and the colours, tones and textures of the furniture fabrics create an intimate setting for calm and quiet contemplation. The exterior deck links the span of tall windows, giving the entire space a connection to the garden and countryside beyond. The changing light, hour and weather imbue an airy brightness at certain times, a warm cosiness at others. At night, sensitive lighting controls are set to automatically create mood, drama and atmosphere. Stone and timber floors reference the natural materials outside and a sense of carefully considered craftsmanship is emphasised by pieces such as the oak bent wood pendant and the hand-stitched leather handrail leading down to the wine cellar. 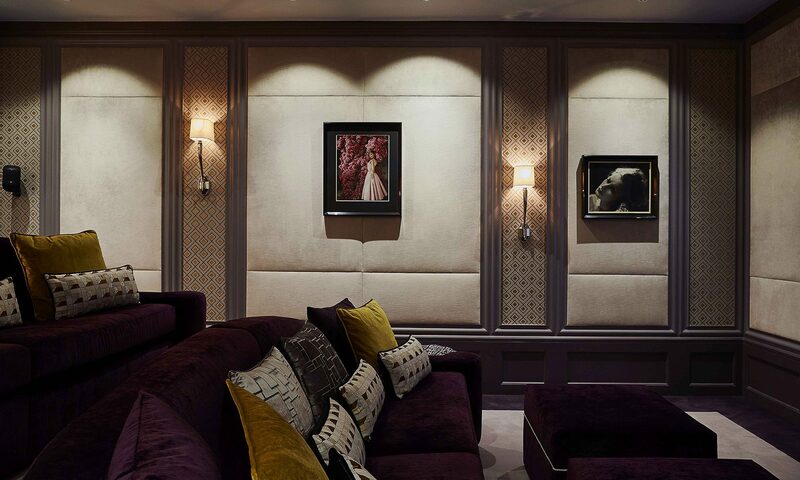 The Hollywood inspired cinema room has state-of-the-art wall-recessed speakers and audio-visual kit, whilst bespoke, upholstered wall panels add subtle opulence as well as benefitting the acoustics of the space. At the rear of the cinema, an intimate tasting table and banquette seating create a visual link to the wine cellar beyond. 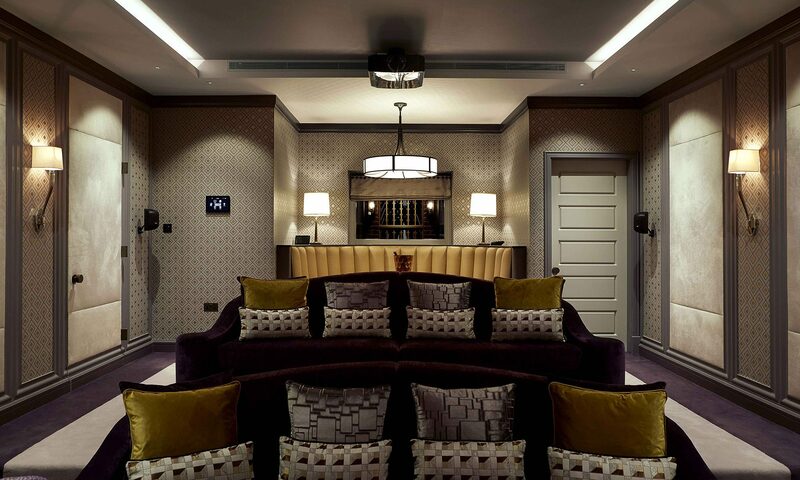 The rich fabrics, which have been selected for walls and deep, comfortable sofas all echo the style and glamour of the original framed photographic movie star prints that grace the panelled walls. All-in-all, an ideal setting in which to settle down with a glass of wine – and an hour-or-two of Audrey Hepburn! 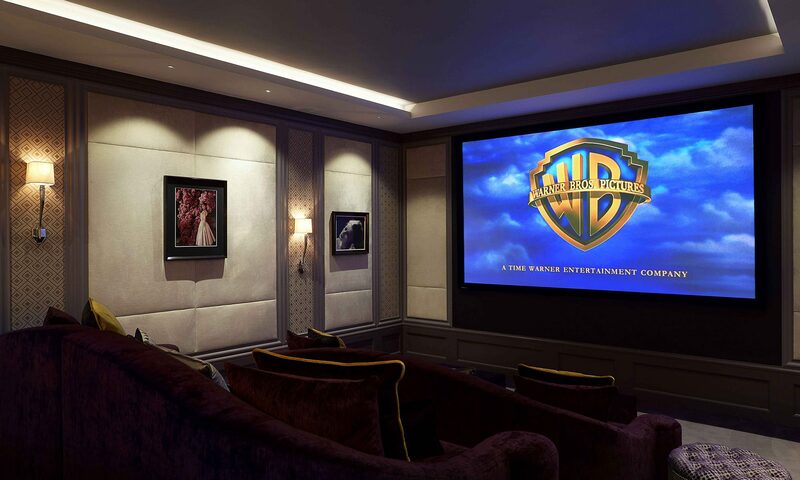 Complementing the basement facilities, the wine cellar houses over one thousand bottles, linking views from both the main stairs down and to the bespoke home cinema area (which doubles as a tasting area). Designed to store wine in a controlled atmosphere with separate chilled area for whites and champagne, our team created an environment inspired by traditional cloister arches with contemporary bronze Crittall glazed doors. The hand crafted David Linley Humidor & stand sits against a feature wall injecting a sense of luxury within the facility.